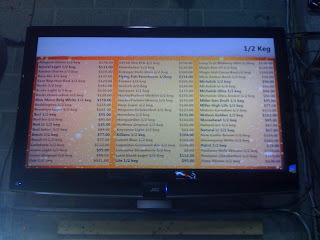 Next time you're at Exton Beverage, you'll notice that selecting and buying a keg just got a bit easier. Greg Ramirez has hooked up a screen above the doorway that is tied into the cash register and inventory system. 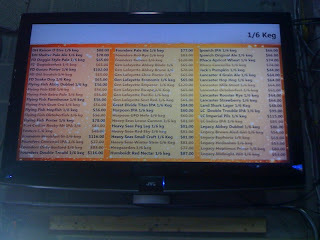 Now, in a glance you can see all 1/2 and 1/6 kegs that are currently available in the cooler and their individual prices. No fuss, no needless conversations with the employees :=p Ah, technology. What's next? Real-time tap lists for bars? Jackie and I checked out the new screen today... very sweet! I am coming to the end of my Yards Brawler sixtel... trying to determine what to get next... any suggestions? I am looking for something under $75.